In 1919 the Sankey Commission was setup to investigate the structure, wages, working conditions and profitability of the coal mining industry in Britain, One of its recommendations was to established a Miners Welfare Fund (initially called the Betterment Fund) designed to better the living and furtherance of recreation, education and research work for miners and their dependents. A Central Committee was appointed by the Board of trade and money was obtained from a penny per ton on all coal raised, which totalled one million pounds per annum. The scheme, which was for five years, was started in 1920. A Codnor Miners Welfare Committee was established with Henry Eustace Mitton as President and George William Eyre as secretary. 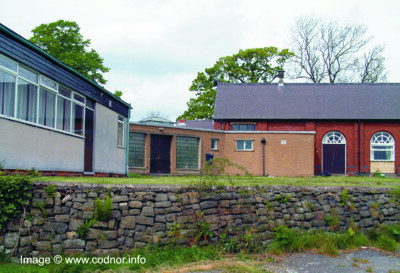 The Butterley Company gifted a plot of land just off Goose Lane and an application for £4500 for the erection of a Welfare and Sports facility was put forward to the Miners Welfare Fund. Unfortunately this first application did not meet with the approval of the district committee. However a revised scheme asking for £3000 was approved. The cost of the proposed Miners Welfare buildings being £2949 10s 11d, and their liabilities were £100. 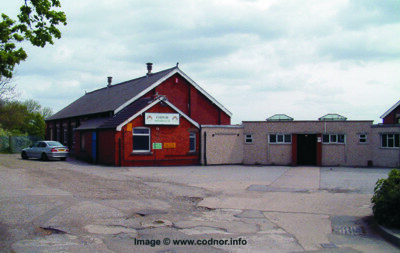 The official opening of the Institute and lecture hall on the Nook Field, Codnor on Saturday afternoon, saw the completion of the Miners Welfare Scheme for Codnor. Mr A. Leslie Wright J.P., performed the opening ceremony and formally handed over the buildings and recreation grounds to the Codnor Sports and Athletics club. A feature of the Codnor Scheme is the sports field of seven and a half acres, which when completed will form one of the finest recreation grounds in the county. Cricket, football, four tennis courts and a bowling green are laid or are being laid out and all these games maybe carried on simultaneously. The institute buildings are at the entrance to the ground, built on high ground commanding a splendid view of all the games. Three separate buildings are erected in the form of a letter L, viz . ; Institute and concert hall with lavatories, baths etc, between. The institute on the right of the main entrance comprises billiard room, games room, reading room and stewards room. This well lighted billiards room measures 30ft by 30ft. with two full size tables complete with all modern equipment. A raised platform is fixed all around with comfortable seating. The games room 30ft by 15ft is fitted with comfortable armchairs and eight tables. The Steward’s room, arranged for storing the usual refreshments, measures 15ft by 12ft and is designed for easy access to all rooms. The reading room 15ft by 15ft, is placed beyond the Steward’s room, and offers a quiet retreat. It is hoped shortly to establish a library in this room. In the basement under the reading room is fixed the heating apparatus. Radiators are fitted in every room, the circulating system being ideal. Hot water is also supplied to all the baths and washbasins. The concert hall on the left is 60ft by 30ft and is capable of seating 306 persons. This has been designed to cover all requirements, and covers a long felt want in the Codnor district for social functions etc. The clear stage measures 18ft by 10ft, with proscenium openings 11ft high and dressing rooms arranged on either side. French windows are fixed along the whole of one side of the concert hall, over looking the sports ground. Easily removed partitions from floor to roof form five spacious dressing rooms during the daytime and for small meetings when the whole of the concert hall is not required. Installed in the concert hall is a fine Brinsmead pianoforte. 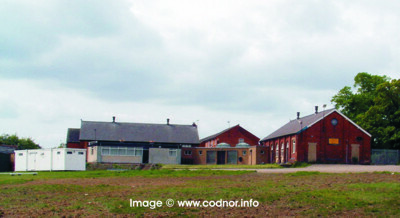 All the buildings are electrically lighted throughout, current being supplied from Ormonde colliery. The contractor for the building was Frank Sisson of Langley Mill. Amongst those present at the opening were Mrs Wright, Mr Fitzwalter Wright, Mr M.F.M. Wright, Mr H.E and Mrs Mitton, Rev S. Elder, Dr. and Mrs Thomson, Mr E and Mrs Drabble, Mr E.S Lamb J.P. and Mrs Lamb, Mr B.D. and Mrs Elliott, Mrs Lovett, Mr J Holbrook J.P, Mr H.H. Holmes, Mr C.P. Proctor, Mr W.H. Eyre, (Chesterfield), Mr T Benson, Mr Fowkes, Mr H.A Jackson, Lieut. Col. Banks, D.S.O., Mr J and Mrs Egglestone, Mr G.W. Eyre, Mr E. Lamb, Mr G. Jepson, Mr H. Tagg, Mr R. Pare etc. Miss Florence Greaves, Miss Jessie Shaw, Master Laurie Hunt, Miss Kathleen Gimson, Miss Winey Surgey, Miss Hilda M. Hinds, Mr J. Egglestone, Mr J. Brough. The arrangements for the day were in the hands of Mr Edger Drabble, chairman, Mr George William Eyre, secretary, of the Miners Welfare Fund and Mr Ernest Lamb, secretary of the Sports and Athletics Club. Tea was provided for visitors and members by Messrs Ramsdens of Derby and during the proceedings selections were played by the Codnor Old Prize Band. In the late 1930's a travelling theater company known as the "Blood Tub" used the stage to perform such classics as "Maria Marten - Murder at the Red Barn" and "Charlies Aunt". During the last war the Welfare was requisitioned by the Ministry of Food for the storage of flour in the concert hall. 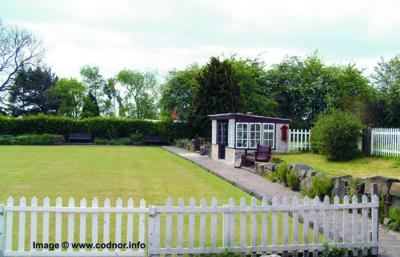 It has been the venue for the Annual Codnor Carnival and also used by some of the local schools for sports events, as well as being the home of the Codnor Cricket Club. 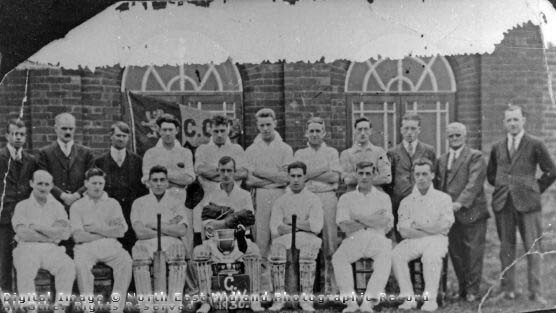 Fig.3 Codnor Miners Welfare Cricket Team 1930. Openwoodgate league Champions. Back Row left to right: Geo. Wain, E.Lamb, G.Hague, D.Ratcliffe, E.Street, W.Ratcliffe, R.Bamford, F.Kniveton, M.Outram, P.Lamb and Vin Cox. 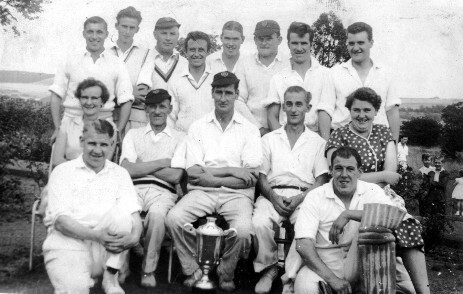 Front Row left to right: D.Taylor, A.Ratcliffe, E.Hicking (Captain), D.Henson, L.Parkin, F.Street and J.Saunders. Front Row: Walter Brown, Joe Belfield, Charlie Kirk, Norman Roberts, ? Alf Woolley was club Steward for 20+ years before he moved to the Moss Cottage. 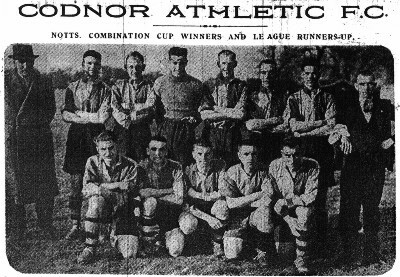 Fig.6 Codnor West End football team. It is thought that the team was originally started by the Bartrums of West hill, hence the name. 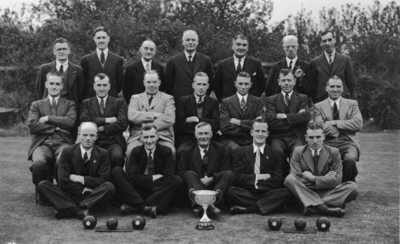 They played at Codnor Miners Welfare and this picture was taken in front of the bowls pavilion in 1954. Names left to right Back Row: Ogar Gillett, Peter Nicolls, John Stone, Barry Clarke, Nev Robinson Nigel Foulkes, Len Dixon (trainer). Front Row: Nobby Freeman, Gordon Lavender, Kenny Burgin, Colin Pearson, Maurice Carrington. Displayed courtesy of Doreen Nicholls and special thanks to Nev Robinson for the information. Back Row left to Right: Charlie Dooley, Alan Collage, George Waite, Nigel Foulkes, Eric Roberts, Barry Clarke Norman Freeman, Barry Weightman. 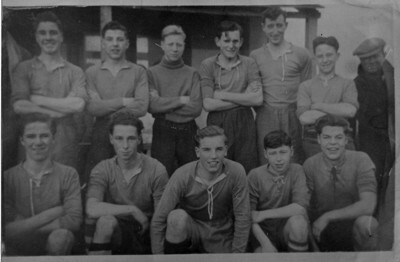 Front Left: Frank Redfern, Front Right: Aubrey Ratcliffe. 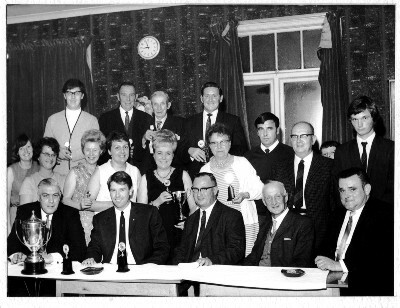 Fig.8 Codnor Miners Welfare Bowls Club 1971, I need some help with these names.